So tonight I thought I'd address one item specific to the WE Combat Desert Warrior 4.3 and one item that is applicable to pretty much all Airsoft gas blowback pistols. 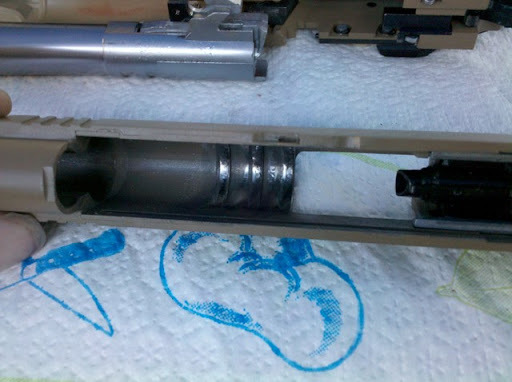 First, the problem I've run into with the Desert Warrior is that the internal ridges on the metal slide were getting caught on the outer barrel, causing the slide to get stuck in mid-cycle. I would have to push the front of the outer barrel back towards the trigger in order to get the two pieces unstuck. This, obviously, is no bueno. I first determined the cause of the problem by using a blue sharpie to color in the outer barrel where I could already see some slight wear-marks. The engineers in the crowd might recognize this technique, though those that know what they're doing use an actual dye kit or whatever it's called. Anyway, I had a blue sharpie, and it did what I needed it to do. Once I fired the gun a few times with the blue sharpie/dye marker on the barrel, i could see more easily where exactly the two parts were getting caught up on. Pretty much where I suspected. I had two options: modify the inside of the slide or the outside of the outer barrel. For aesthetic reasons, I opted for the inner slide mod because I could pretty much gaurantee that things were gonna get ugly, so at least it wouldn't be visible once the slide was reinstalled onto the frame. Basically, I just took my lovely Dremel rotary tool and ground down the ridges you see pictured below until the gun stopped getting stuck. Also, just for good measure, I did a light polishing job on the outer barrel using the Dremel buffer bit and the polishing compound they give you in their "bit kit." With a little patience, steady hand, and some mild intelligence, I had my favorite pistol among many favorites in my collection back up and running like an absolute boss. See below for a shot of the three ridges I'm talking about. They may even have an official name, derived from their real steel counterpart, but I don't know that sort of thing.